If you’re going big on candy, the best place to do it is Texas of course! The craving for sweets is simply a part of life and when that craving hits, you’re going to want the best. 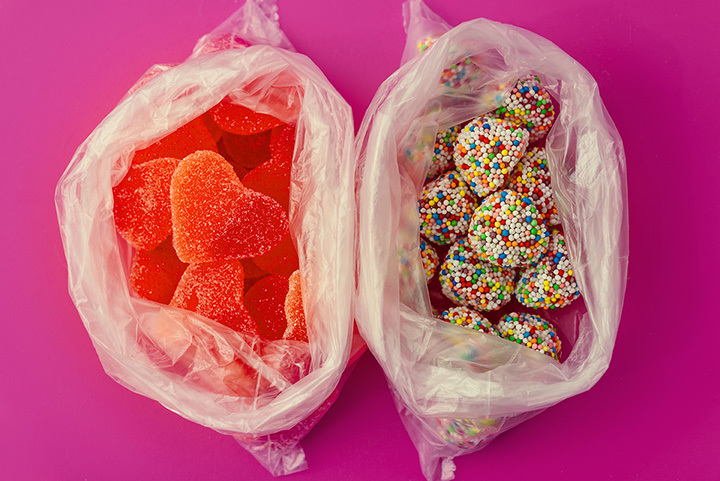 Find everything from classic taffy to mouthwatering chocolates at these 10 awesome candy stores in the Lone Star State. Start with a circus elephant on top of the clearly circus-style sign and Austin's Big Top Candy Shop represents one of the greats in Texas candy shops. Given that the average sale is just $6.50, the only way to stay open is with incredible volume, and that's proven out by regular lines around the block. Featuring a soda fountain that offers Blue Bell ice cream, alongside over 2,000—yes, you're seeing three zeroes and no period in there—kinds of wrapped candy, Big Top Candy Shop delivers the sweet on most every front. Denton's Atomic Candy pushes the 1950s sci-fi kitsch for all it's worth, but this isn't just a retro sci-fi wonderland. Oh no, this place is all about the sweets, offering over 300 kinds of candy and a rotating selection of 250 kinds of soda. Throw in a few unusual novelty items for added fun and it's clear that Atomic Candy will provide not only the sweet, but also the strange to make a surprisingly complete package. Carrolton's Blooms Candy & Soda Pop doesn't mince words. It offers exactly what it says on the sign, and in a big way. With over 250 breeds of soda, and better than 800 breeds of candy, you're going to have most any sweet taste you care to name on hand. Plus, the breeds go back in time, which is great for those older folks craving a Nehi or the like that just can't find it. Throw in some esoterica like Bacon Soda, as well as the fact that they take requests—can't find it at Blooms? Ask for it!—and the value here becomes clear. If you're in the Stock Yard district in Fort Worth, then you're in the right place to check out the Candy Barrel, a shop in Stockyards Station known for its array of old-timey candies. The showstopper here is taffy, with a wide array of kinds on hand, but there's also such unusual fare as Chick-o-Sticks, Sky Bars, and even Squirrel Nut Zippers. There's plenty else to see in the station after the candy, so be sure to stick around. While popcorn is certainly on tap here, an entire wall of the store is devoted to various kinds of candy, possibly to cut the salty taste of all that popcorn. Throw in the sweeter kinds of popcorn, like caramel or kettle corn, and the end result is an outing just as sweet as any other. Welcome to Houston, and one of the biggest sources of pure chocolate in all of Texas: the Chocolate Bar. The question “How do you like your chocolate” doesn't seem like it'd have all that many answers, but man, does the Chocolate Bar ever try. Featuring chocolate animals, pizzas, dipped fruit, dipped cookies, gourmet bars and “Texas stuff,” you know there's no shortage of variety here. Throw in the various desserts as well as coffee drinks and you've got a complete package for the ages. Galveston's La King's Confectionery is sometimes referred to as the most famous old-fashioned candy and soda shop that Texas can offer. Operating since the 1920s, the store has kept much of its old-fashioned grandeur around, offering up a wide variety of treats from divinity to taffy and beyond. Using methods kept whole and breathing from the 19th century, the end result is an authentic old-time candy experience. Throw in the 1920s soda fountain, and the fact that they take requests, and you'll have most anything you could ask for here. Katy's Schakolad is a chocolate wonderland, fairly dripping with options all “made fresh on premises.” That's actually an important enough distinction for quotes, as the shop notes that it's not pre-packaged from a central location, but rather made completely in house. With a huge array of treats to choose from, including some for those who keep kosher or engage in vegan practices, your sweet tooth should prove well-sated here. Head to Roanoke to check out Hey Sugar, a candy shop in Roanoke's restaurant district. You'll know it's a candy shop the second you walk in and see not only a vast panoply of candy treats, but also “Charlie and the Chocolate Factory” playing on a screen inside. While the candy is center stage here, including such fare as Fizzies, rock candy and more, the store also hosts movie nights designed to add more value and make for more chances to buy candy. The Alamo is a figure of at least mild reverence in Texas, depending on who you ask, so for San Antonio's Alamo Candy Company, it's a lot to live up to. The Alamo Candy Company focuses on not only American candy, but also Mexican candy, and even some creations all its own. Gummy bears, Astro Pops, fruit belts and more all await you here at this unusual but exciting alternative.